Sparkling mica minerals are swirled in to this balmy lip color to give your lips the shimmering kiss of summer without any synthetic ingredients. Mica is made of crushed gemstones called phyllosilicate minerals. These tiny twinkling lights naturally reflect the beautiful rays of the sun, the gleaming lanterns of the evening, or luminosity of ambient light. Bare your lips to the world with this perfectly pale lip color of of creamy café au lait, a shimmering shade of sparkling sand. 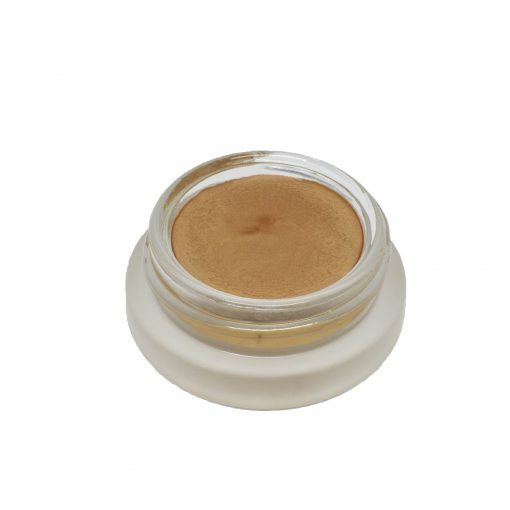 The sheer taupe-toned shimmer burnishes a fresh faced glow. Let lush lips imbibe upon this botanical balm! The foundation of Beach Beauty Lip Shimmer is our happy beeswax made with love and dedication by healthy, buzzing honeybees. Beeswax is a natural skin protectant that forms a porous, breathable layer of protection over the lips. To the beeswax we add jojoba for moisture, carrot seed for balance, palmarosa for skin cell regeneration, grapefruit to plump and energize, thyme linalool to heal and tone, Roman chamomile and vetiver to ease inflammation, and coffee for its anti-aging action. Jojoba (Simmondsia chinensis) – Step out of the dry, cracked darkness into the luscious light with nature’s most uplifting emollient. Pure jojoba infuses your pout with all soluble forms of Vitamin E. This naturally occurring compound is a tantalizing twin flame, so similar to the skin’s sebum it can’t help but melt into thirsty lips. Happy Beeswax (Cera alba) – The honeybee delights in protecting the Queen Bee, just as our Happy Beeswax delights in protecting your pout. This natural, petroleum-free ingredient forms a porous layer on the lips, sealing in moisture. Let you lips breathe as you face the world: a Queen Bee guarded by nature’s waxen, wondrous shield. Carrot seed (Daucus carota) – Captivating carrot brings balance to skin, delivering intuitive nourishment to tissue that has become too dry or too oily. Sunburned and chapped lips will relish the grounding, healing essence of pure, steam-distilled organic carrot oil. Palmarosa (Cymbopogon martini) – Lemon and rose make sweet love to the nose! Fresh, citrusy palmarosa oil is used to regenerate skin cells with the added benefits of stress reduction and anxiety busting. Your fresh, fragrant pout will be ready to reap all the wonders of the shoreline. Grapefruit (Citrus paradise) – Grapefruit creates a fruit-juicy pout shimmering with vibrant energy. This citrus wonder makes lips sparkle and shine thanks to its uplifting powers of positivity. It is also said to focus the mind and clarify the skin around the lips. Thyme linalool (Thyme vulgaris linalool) – Thyme linalool is a potent antiseptic that balances oil production and prevents skin infections around the lips and mouth. As a major anti-microbial ally, it offers endless healing support for infection-prone pouts. Roman Chamomile (Chamaemelum nobile) – Roman chamomile is a powerful anti-inflammatory that’s perfect for sunburned lips. It is calming, sedating, and soothing for beach beauties who’ve imbibed in a touch too much sun. Vetiver (Chrysopogon zizanioides) – Vetiver is used to prevent cracking, chapping, and inflammation on and around the lips. Even better, its rich, herbaceous aroma makes our Beach Beauty Lip Shimmer smell like a sun-and-surf botanical fantasy come true! Coffee (Coffea arabica L.) – Coffee essential oil fights inflammation and is a fierce anti-aging oil used to prevent the onset of photo-aging. It is packed with vitamin E, sterols, fatty acids, and antioxidants to protect, rejuvenate, and restore your lips to their fullest, most magnificent manifestation.